Mexican food is one of my favorite cuisines. Born in Tucson, Arizona, my parents fed me fresh, delicious and healthy Mexican cuisine starting at a very early age. After we moved to Michigan, we took regular vacations back to Tucson to visit friends. One of our traditions would be to take a day trip to Nogales, Mexico. These early memories would be the foundation of my love affair with Mexican food. The best part about authentic Mexican food is that it isn’t loaded in cheese and creamy sauces that you tend to associate with American Tex-Mex. Fresh tacos are served with grilled meats, fresh lime juice and chopped cilantro. 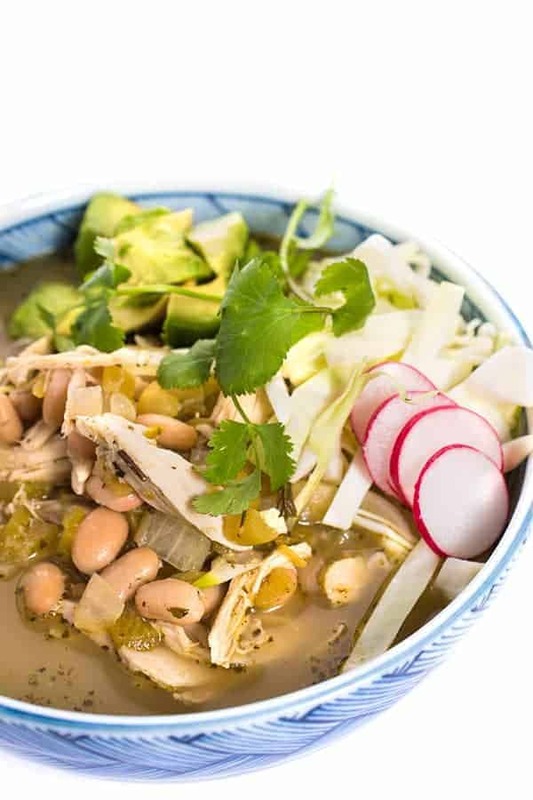 Sopa de Pollo is a warm and filling broth-based chicken soup with more lime and cilantro. Pesce dishes line the menu featuring freshly caught fish from nearby waters. It is all a very far cry from the 2,000 calorie burrito you find at the mall food court. 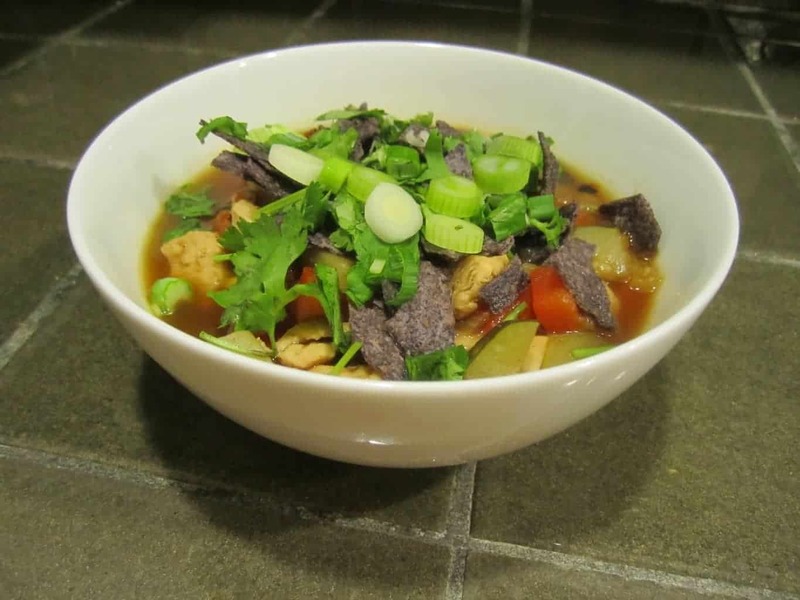 Today’s recipe is in honor of a San Antonio based classic: Chicken Tortilla Soup. My version is probably not very authentic but when you live thousands of miles away from Texas, it gets the job done. 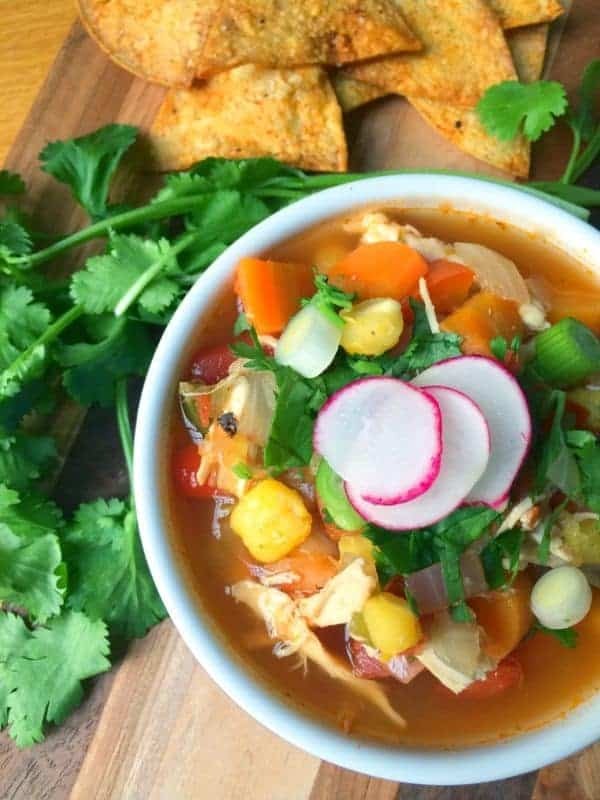 The trick to my soup is using low calorie ingredients that pack a major flavor punch. If you’ve never cooked with chipotle peppers in adobo, I encourage you to pick up a can at your local grocery store. 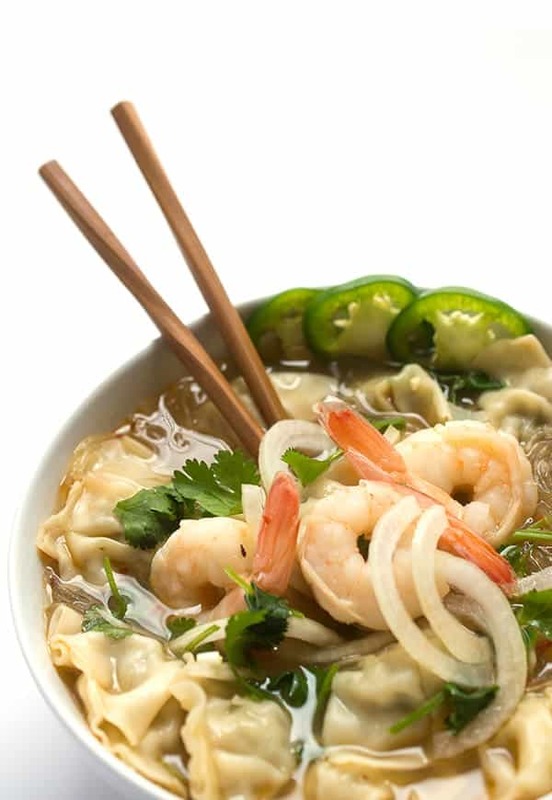 The smokiness adds a depth of flavor to the soup that is hard to create any other way. Can’t stand the heat? Remove the seeds and pith from the pepper before chopping. And don’t forget the toppings – let your friends and family top their bowls with whatever their little hearts desire. Heat a large soup pot over medium-high heat and coat with non-stick spray. Add chicken pieces, cumin, poultry seasoning, salt and pepper and cook 5-7 minutes or until chicken is browned. Rotate the pepper with tongs every 60 seconds until it is evenly charred. Place pepper in a glass bowl and cover with plastic wrap; set aside. Once chicken is browned, remove from the pan and set aside. Add onion, zucchini and garlic to pan and cook for 3-4 minutes or until vegetables are softened. Cut top and bottom off of the pepper and de-stem. Dice pepper and add to pan with other vegetables. Add chipotle peppers, chicken broth and tomatoes then bring to a boil. Add frozen corn and simmer for 20-30 minutes. Excellent source of Vitamin C, good source of Vitamin A and calcium.